Neal Anderson is another former Chicago Bear whose reputation was much maligned as his career was waning. Anderson's contirbution to Bears history is clear-he replaced the legend Walter Payton and ended up the second all-time leading rusher on a team with more great running backs than any. Anderson was a steal when he was still on the board as the Bears picked in the first round in 1986. It was a known fact that Walter Payton would probably only play one more year, so the team needed a back to develop before he left the game. Anderson made an early impression in '86, earning all-rookie honors for his special teams play. Also to be remembered was his 66-yard run for a touchdown at Houston. As Anderson burst through the hole and was 20 or so yards down the field, the network cut away to air a special report on the Iran-Contra hearings. As the game resumed, fans found out that the run had been called back on a holding penalty. In 1987, Anderson was used in a very non-traditional way-as a fullback. Chicago decided to use him as such in an effort to get him more playing time, while still starting hall-of-famer Walter Payton. Anderson led the team in rushing in the strike-shortened season. Anderson then had a breakout year in 1988 after Payton's retirement. He rushed for 1106 yards, caught 39 passes for 371 yards, made the Pro Bowl, and scored the longest rushing touchdown in Bears' history, an 80-yarder against Green Bay. 1989 was even better, as he went to his second consecutive Pro Bowl, rushed for 1275 yards, caught passes for 434, and was named NFC Offensive Player of the Month in September. By 1990, many were calling Anderson the "best all-purpose back in the NFL", a tribute to his rushing, receiving and blocking skills. Anderson became known for his ability to turn the corner with great speed, often diving for the endzone and barely hitting the pylon in a graceful leap. He rushed for 1078 yards in 1990, which turned out to be his last great season. Prior to the 1991 season, Anderson's career was interruped by family issues that were out of his control, and his production began to drop. The 1991 season was filled with disappointments, as he was hampered with a pulled hamstring all year. He missed three games with the injury, the most in his career. Still, he performed magic on a 42-yard TD run, capped off by his trademark end-zone dive, to win the game against the New York Giants. Anderson's 1992 began well, as he scored twice in the opening day victory over Detroit. But he couldn't seem to get untracked, and it also didn't help that he was repeadedly benched in favor of developing second-year back Darren Lewis. He wound up rushing for only 582 yards, but did surpass Gale Sayers for second place on the Bears' rushing list on opening day. Dave Wannstedt did keep Anderson on for the 1993 season, in which he rushed for 646 yards and scored his 51st touchdown as a Bear. Anderson's tenure came to an end as Tim Worley, a troubled RB from Pittsburgh, received more playing time. Anderson decided to retire after the 1993 season, and aside from playing in the occasional golf outing, has led a quiet post-football life. However, his trademark endzone leaps, and bursts of speed, will live forever in the minds of Chicago Bears fans. 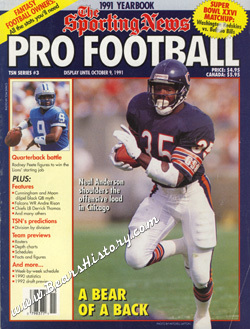 Anderson became the second all-time leading rusher in Chicago Bears History in 1992, just his fifth year as a starter. Sadly,he retired following just one more year in football, as nagging injuries took their toll. Since Anderson retired, Raymont Harris is the closest to him in total yardage but still trails by almost 4,000 yards. Anderson rushed for 6166 yards on 1515 attempts with 51 touchdowns in his career. Known as the best all-around back in the game while he played, Anderson also caught 302 passes for 2763 yards and 20 touchdowns. That puts him fifth on the Bears' all time receptions chart. Anderson wasn't just a key blocker in Mike Ditka's two-back attack. He actually played fullback in 1987 to get on the field with Walter Payton. At that position he amassed 586 yards rushing and 467 yards receiving, leading the team. Anderson held out for a well-deserved raise in 1990 and received it. After the contract expired following the '93 season, he opted to retire rather than pursue a new team.